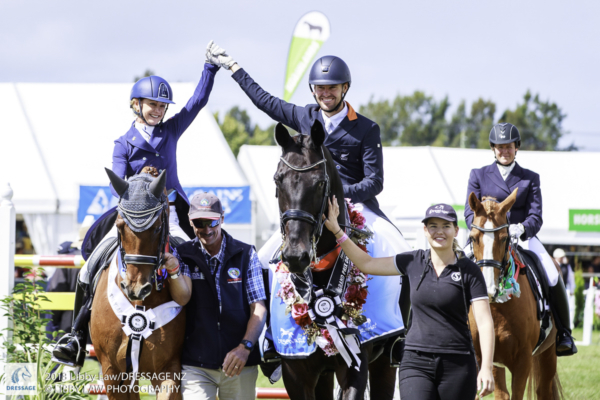 Dressage’s bid to take a team to the World Equestrian Games is looking positive after a strong finish by both John Thompson and Julie Brougham in the GJ Gardner Homes CDI3* GP Freestyle. Thompson won the class and consequently the Dressage Horse of the Year title with a 74.525 score, the incredible JHT Antonello giving nothing less than his very best, as he does every single time – what a heart he has. Brougham finished on 73.7 for second place in the class and runner-up for HOY accolades. Their very high-degree-of-difficulty test – including two sets of double pirouettes on the centreline – looked effortless, Vom Feinsten showing his usual gorgeous bounce and enthusiasm for his work. Wendi Williamson was pleased with Don Amour MH (69.850), who today managed to contain his extra bounce! “He was a little naughty in the canter yesterday, but I am really proud of him today,” she said. With a new Latin soundtrack and perfect timing, Jody Hartstone and Ali Baba saved their best for last and aced the freestyle to finish fourth on a personal best of 68.925. Lucarne Dolley completed her Young Rider hat-trick this morning, winning the CDI-Y Freestyle by a clear margin (69.975). A working pupil for Vanessa Way, Dolley’s foot perfect test aboard the elegant 10-year-old Ardmore saw her take the Young Rider of the Year for 2018. Following her into reserve was Amy Sage on RM All About Me, apart from a small hiccup in their three-time-changes the pair delivered a polished performance (67.275). The upstanding Anamour gelding NRM Andreas, beautifully ridden by Vanessa Way, won all his L8 tests including this morning’s freestyle with 71.35. These two were a standout and clear winners at this level, showing some already-Grand-Prix-worthy passage and piaffe. A cut above, Way’s riding and experience shone through and she absolutely deserved the title. Runner-up went to Nicky Daulton (nee Pope) and Saskatoon.